That would be a Whole Other Conversation… - Charley Brady - Opinons; My Own. As we hear that Angela Kerins may be about to resign, it seems rather appropriate to post this piece, written two weeks ago, but appearing currently in the April issue of Chicago’s Irish American News. Yes, quite: a whole other interesting conversation. 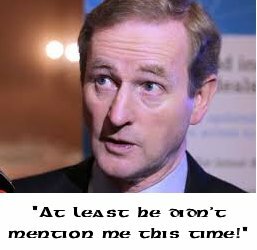 Whenever the appallingly arrogant Angela Kerins makes one of her increasingly pointless appearances before the Public Accounts Committee, it makes for any number of different tangents that we could go off on. And if any one person was able to make me think of a reason to vote for Sinn Fein (unlikely) it would be Mary Lou McDonald. Her single-minded pursuit of trying to get anything out of Kerins that approaches something resembling a sane answer is admirable in itself. There’s a sheer tenacity there that I’m not entirely sure I would have the stomach for. It would just wear me down. But it’s when it is combined with her looks of sheer disbelief that I believe McDonald captures the bewilderment of the person in the street who is looking at Kerins and, sadly but understandably, saying to themselves: Why would I ever give to charity again, when I see that it’s going to the likes of this vain, inexplicably preening woman—and her family. Let’s not forget them, because between the brother, the husband and the rest of the shower, nepotism is alive and well in the grasping, insular world of Angela Kerins. I have no problem with paying a person what they are worth; but it’s not exactly as If Angie & Co. have really given much value for money. And dare I say it, but on so many levels—not just the horrendously small return on their Rehab scratch cards—they are a dismal failure. On top of that I mean, seriously: in a world where people tend to die just as part of living, who would have thought that anyone could make such a spectacular mess of trying to set up a coffin-import business with the Chinese? After all, people are always going to need coffins at some stage…you’d think? 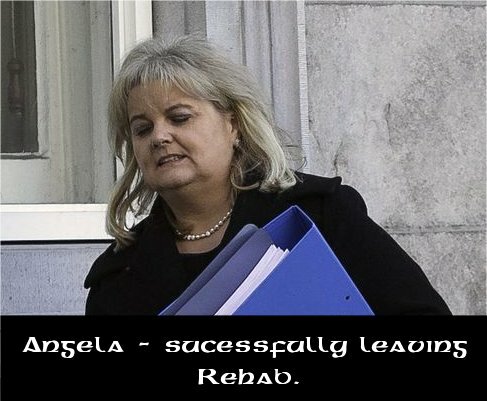 Look, I made a New Years’ Resolution that I would try to be kinder to people during 2014, so I’ll put it this way: the world of Angela Kerins is…odd. On what planet do you instruct your lawyers to contact the Irish-American website Irish Central and order them to remove an article? I don’t live in the States but the last time I checked they still had this troublesome little thing called the First Amendment. In my innocence I’ve always thought of that as a pretty good idea. Angela doesn’t agree– that is her right; but it’s kind of a daft thing to do since tens of thousands of people who had never heard or could care less about her, now have and do. That’s harsh, at best; especially since they were being paid a princely €1.14 an hour over the €7.95 state subsidy. And I may not be the world’s most caring person, but if I had been sending out that letter to intellectually disabled workers, I know in my heart that I would have checked first to make sure that they could read. In this case, many could not. So it was left to their families to read that nasty little dismissal to them. To tell them that they were ‘redundant’. I don’t like that. That’s the kind of thing that has my teeth grinding. And I don’t like it when my teeth grind. It makes that New Year’s Resolution all the harder to hold on to. I mean, the one about losing weight went to the wayside around January 2nd; but that kind of heartless carry-on makes me want to reach for the red-hot tongs, the tongue-pincers and forget all about being nice. Now, I was never the best with Math and so I’ll leave it up to you to work out how Rehab would have been better off, financially: getting shot of these workers, or getting shot of Angie Kerins, her helicopters that were laid on by wonderful benefactors; and particularly her quarter-of-a-million-a year paycheck. Of course, that paycheck is where she really made the public sit up and take notice. She refused,—a charity worker, where transparency as to where the loot is going, is everything—flat out refused to divulge it. Then she announced, as if she was Queen Muck of Chuckle Island, that she would deign to tell us in a month’s time what she earned…well, call me an old cynic and you’ll be right; but in Brady’s Big Book of Home Economics a month puts aside a whole lot of time for some creative accounting. Still, as of this morning (March 14th), Rehab has made it clear that they will simply be refusing to answer certain key questions in the future, unbelievable though that may sound to someone who doesn’t actually live here. In fairness, the Public Accounts Committee has been going after this as much as they can within the parameters of some of our more ridiculous guidelines; but you know what? It’s just not good enough. The damage that these people have done to charities as a whole is really yet to become known. That is a bloody disgrace. On March 5th, Hand in Hand, the children’s cancer charity that I have the privilege of working alongside Jennifer Carpenter with (and she is the real, unsung, motivating force behind it), was invited to Leinster House by Senator Fidelma Healy Eames. The Senator was gracious enough to host a coffee morning for us; and I must say that no one could have put herself out more than she did. We’ll never be able to thank her enough. Although this tiny charity has traditionally served the West of Ireland, the increase in children being diagnosed with cancer has risen enough that our assistance is being constantly asked for by many other counties. The hard truth, though, is that it’s tough enough for us to stay on the black side of the ledger; nor are there helicopters (paid for or otherwise) laid on for us to travel in. Strangely enough, not being Angie, we wouldn’t expect it. So this was a wonderful opportunity for us to take our case to the TDs and Senators of Ireland. We were gratified that so many turned up, which I suspect was down as much to the spirit and enthusiasm shown by Senator Healy Eames as to our own considerable efforts. I think that anyone who has read my columns over the years knows by now that I don’t shirk from giving credit where it’s due, just as I’m never afraid to throw abuse at those politicians who have forgotten that they work for us. In this case, however, I have no hesitation at all in sending our thanks to the Senator on behalf of Hand in Hand and children who have been diagnosed with cancer. The amount of work that she has put into supporting us has gone far beyond anything that we could have hoped for. Again, and this is just me being weird, I’ve a feeling that if I ever went into the coffin-making business for charity… I would remember it. And I wouldn’t need a notebook to jog my memory. Couldn’t agree with you more, Michael; but let’s make a deal and neither of us hold our breath, eh? Let’s see, she fired the people who she is the head of the charity that is tasked with helping. Over here we call that a “Catch 22” – we are going to hire you because you need our help because of your disability, your work is not good enough because of your disability so we are going to fire you, oh, you need our help because of your disability so we are going to…… do what? The truth is the same both in Ireland and here – steal small and go to jail, steal large and get away with it.